You are not logged in. [Log In] Home » Forums » Mac OS X Software » Mac OS X Applications » Time doing a replace, nothing happens. How do you not have a bootable system? I don't think that has happened to me... maybe years ago.not even sure. The regular boot drive on the system had become corrupted during installation of a beta software release which among other things included converting the boot drive from HFS+ to APFS (encrypted} so my clone could neither access the drive or repair it. And you use the edrive? — I've hardly used that so rusty- should practice it. Actually I don't use an E-Drive per. se. for many reasons. Instead I have a "ProToGo" USB SSD with two bootable images on it. an image of the Recovery Drive plus TechTool Pro which will boot any recent Mac; run TTP or Disk Utilility. Restore the entire system or just the data and/or apps from another drive or Time Machine Backup. a Basic image that will only boot the system it was created on or an identical configuration and includes several repair and maintenance utilities including TTP. And booting from TM? Can't get my head around that either. seems very complicated. I don't even think I have system on TM not sure. You cannot boot from Time Machine, but you can boot from the Recovery Drive (or a ProToGo image of the Recovery Drive) and reinstall from a Time Machine backup. Holding ⇧⌥⌘R during a cold boot (installs the version of MacOS that shipped with your computer or the closest available version. I tried to boot from Time Machine using the Option button at restart. The startup options presented were my main drive, my Super Duper backup, or Time Machine. 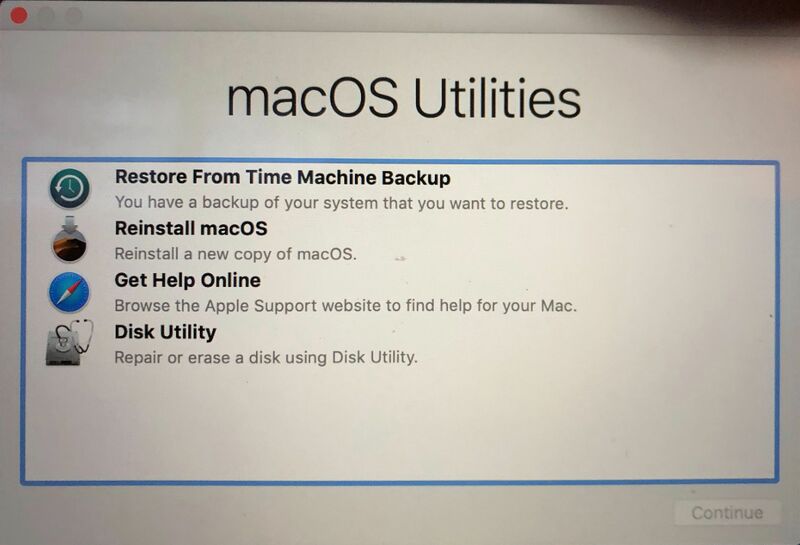 I selected Time Machine, which it took quite a while to load and, when it had, it showed a Utilities set of options which included (if my memory is correct) reinstall from Time Machine, Reinstall the OS, Run Disk Utility repair....and something else. Would it be right to assume that's what a person would see if using the Recovery Drive? When you boot from the Recovery Drive using ⌘R the screen looks like this. I just checked all the computers here and all are running Mojave. An Option boot does not offer Time Machine as a bootable option. Go to System Preferences > Startup and see if Time Machine shows up there as a bootable option. I have no explanation why yours shows up, but Apple does not believe you can boot from a Time Machine backup either. Are you sure that at some point you didn't install MacOS on your Time Machine drive? Yup….that’s exactly what I saw. Go to System Preferences > Startup and see if Time Machine shows up there as a bootable option. Nope….it only ever shows my main drive or my Super Duper drive, if I have it turned on. However, if all drives are turned on and I use the Option key on a restart, I get Main Drive, Super Duper drive and Time Machine drive. Are you sure that at some point you didn't install MacOS on your Time Machine drive? I have no idea….but I guess I must, and I assume that happens every time with my Time Machine. That’s because Time Machine periodically says it doesn’t have enough room to complete a backup and I start from scratch. i.e. I erase the drive and start a new backup. Most recently was about 3 or 4 weeks ago. Wait, wait, wait....I can confirm that I do have the system on the Time Machine drive. Your query caused me to check which things were excluded under "Options" and the System folder is not among them. Something doesn't compute here... If you've got an OS on your TM drive - I believe it was ganbustein who, a few years back, posted the option to make a TM drive bootable. - why do you boot into Recovery rather than the OS when you select the drive from an option boot screen? ...Time Machine periodically says it doesn’t have enough room to complete a backup and I start from scratch. i.e. I erase the drive and start a new backup. Most recently was about 3 or 4 weeks ago. But if you erase the drive, which sounds like the entire drive, the OS would be erased and need to be reinstalled along with TM's being restarted, and it doesn't sound as if you do that. Why do you bother with Tech Tool when you have all those free options by Apple you outlined? For simple people like me the Apple recovery should be fine no? ON topic of progress with the OS, I thought maybe TTP and what was other one I had for years...can't remember the name, great in the early 2000s are obsolete. ProToGo is a thumb drive, or other device with a subset of MacOS and a selected set of bootable options. In my case there are two bootable options on the same thumb drive as I described. I made the ProToGo and keep it current because I have several computers around here and I sometimes support friends and neighbors Macs when they have a problem. The ProToGo provides a handy way of doing that. NOTE: it has been at least three years since I needed to use an industrial strength volume repair utility like TechTool Pro so for all intents and purposes I keep the ProToGo out of habit — not necessity. is this free proto go? Yes, but according to Apple that is not a bootable copy of the OS. Did you ever install MacOS on the drive you now use for Time Machine backups? If so what you are seeing may be a Recovery Drive. I don’t. If I have my three drives running (Main, Super Duper, Time Machine) and I do a restart while holding down the Option key, all three drives appear. I can boot from The Main and the Super Duper but the Time Machine goes to the recovery screen that joemike posted. To be clear….the Time Machine icon is exactly the same as the one on the desktop…green with the clock and counter-clockwise arrow circling it. Correct….I do a full erase and then select the drive to do a full Time Machine backup. I do not do, and never have done, any OS install on the Time Machine drive. However, neither have I excluded the System folder in the Time Machine Options so I assume that means the system automatically gets backed up. ….according to Apple that is not a bootable copy of the OS. Did you ever install MacOS on the drive you now use for Time Machine backups? No….see reply above to artie. [If so what you are seeing may be a Recovery Drive. Because the Time Machine icon has been stored in the meta data of the drive and is picked up when the system reads the Drive. Generated in 1.897 seconds in which 1.459 seconds were spent on a total of 15 queries. Zlib compression enabled.